If you’re just hearing about this VBS theme, be sure to watch the video below and visit their website for yourself. Cokesbury is a name you can trust for Bible School materials and each year they keep getting better. Click here to download their theme / Bible lessons overview. The giveaway on this post has ended and the winner notified by email. This looks like a complete blast, and it would fit so nicely with our goal of showing kids how God made everything for HIS OWN GLORY! Kids from our church will surely enjoy and be blessed by this. It will engage not just their curiosity but their desire for more things beyond what we can see. It also puts VBS curriculums into the 21st century with an approach that our kids nowadays can relate. Thanks! Looks like another great materials from your web. Hopefully our Sunday School can get these it’d be a blessing! ? Ohhhhh our kids and volunteers will LOVE this! So many fun things you can do and ways to decorate!! This look like the kids will be over the moon about this curriculum. Our students love studying about space and will tie in nicely with our lessons we are already teaching them. This will reinforce their learning of God building the Universe and the Miracle of How he created everything. Looks really fun & the kids will love this theme. This sounds awesome! I think our kids would really be happy with this theme. This is modern and ups to date and has great choices for the daily bible lessons. Our kids are gonna love it! I love all of your materials for my junior church. Thank you for al the wonderful lessons . I love Cokesbury and the themes chosen for VBS. We usually go the water themes but I really think the kids would enjoy this one! I am that it is upbeat and active. No chance of boredom. I truly feel that for the first time doing a VBS program at our church, this would be great. I just started looking a VBS stuff yesterday, and this came up on my computer! I think it is a sign! This looks like a really fun program that I would love to use! Looks like a lot of fun. My Kidzrock kids would really love this theme. Addressing their interests using the Bible is so amazing. We recently took their love of dinosaurs and supported it using information from the Bible. Making the Bible relevant! I am just becoming familiar with your ministry. I was very impressed with the Thanksgiving and Christmas curricula. Our children ages 5-13 will be captivated by this theme. They are very excited when they get to pray for others. Realizing that what they do is far beyond what they can see will be such an encouragement to them. Let’s take the gospel, where no man have tried before here we come Mars! christian troopers are you ready 321 blast off. Wow! This sounds so great! Our kids would definitely love the theme. We do a Mr. Science lesson once a month so I’m so glad to see you’ve included the science part into the rotation. What fun!! I love to decorate for VBS and I can see the backdrops are wonderful. This curriculum is engaging and exciting. Would be “Over The Moon and Back” if I win this for my churches children’s ministry! The kids at the church I attend would be aghast! We don’t have very many and the budget is almost nonexistent (besides what comes out of our pocket). This would be a blessing and the kids probably wouldn’t know just what to say. We would be able to show the community we are apart of a fun way to share the gospel. I’ve just discovered your site and it seems to be chock full of great ideas to energized the kids in our Sunday school class to really learn about Christian principles and to learn that being a Christian can be amazingly fun! What a great theme. The kids in our church would really enjoy this. Though we are small in number, we are great in faith. We did our own Bible School last summer! This “To Mars and Beyond” would be an awesome theme to promote for next summer. Thank you for this chance to win a free Bible School curriculum for our next summer Bible School! We have been an established house church for 5 years and plan to move into our new church facility this winter. One of our first priorities is to make our church known to the children in our new community. This would definitely attract the children. What awesome material! Our kids would absolutely love this! Oh my goodness!! The kids are going to think this is OUT OF THIS WORLD !! I think they would love it, especially if the little alien is part of it! ? I wish to win this one because we’ve never had a VBS at our church. We love to have it but our church still haven’t found budget for it yet. Hello, my name is Raúl Cárdenas from Spain. I am apart of the children’s ministry of Immanuel Baptist Church in Madrid. We are always thankful to the people who give out ideas and prayers to keep God’s work especially in children. We hope that many more will get to know Jesus and may He bless your continuous effort in glorifying him. After viewing the video for this year’s vbs.. I was excited! We are a small church that are building our children’s ministry and we need an amazing and exciting theme like this to inspire our precious youth’ of God’s love..His goodness and power. 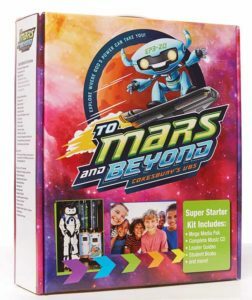 Cokesbury’s VBS 2019 “To Mars and Beyond” looks really awesome! My 8 year old granddaughter really liked the preview and loved the songs (she loves singing). I believe the kids will be excited to the point of exploding with the apparent high energy seen in the preview. Looks like it would keep their attention and pull them right into the action. Thanks Cokesbury for another great VBS program! I had lost my desire to lead VBS over the last couple of years and by decision of our Youth Ed. team along with our pastor we chose not to do it last summer 2018. I do believe that was God’s timing for our smaller church as our pastor left shortly after that decision and we are journeying with a wonderful interim pastor right now as we wait on the Lord and pray for the Man he will be sending to us (http://southforkchurch.net/minister-search) and are also continuing in our 18 month quest to find an new youth pastor. This promo and looking at the themes and activities, etc. actually make me really excited to lead a VBS again, that and one of our young ones that asked if we would do VBS next summer because she missed it. We need to be raising up more young people to walk in dedication the the Lord Jesus and have the desire to want to serve Him in ministry. This curric. in the hands of loving church leaders around the country will surely help to do that! Thanks for this ministry and being faithful to the church of the Lord! Smaller but mighty church that has remained faithful to the Lord for over 180 years! This curriculum looks awesome!! The children at our church really enjoy when I’m able to invest in something that is as creative as this Cokesbury VBS plan. Our church can’t typically afford something like this and the children at my church having access to this could change the way they look at VBS, church and God! Our church is a small, 100% volunteer church. This would be such a blessing. Great theme! Out of this world and into the heavens!! Our kids would love this!! I like the idea of getting out of jungles and deserts and out into space! Music is 90% of our decision when picking a VBS. I like what I hear! We would be so blessed to win this VBS! God is out of this world and sometimes it’s hard for kids to see beyond their own little universe and realize how big God’s creation really is. Yes, there is outer space created by the God who loves us all. Looks like a format which will have great appeal to children. The Space theme is awesome! This would be a fabulous way for our church to do Vacation Bible School for the very first time. This would truly be a blessing to win this for our group for VBS 2019- Love the topic would be interesting to see what it involves. My kids would love this! We want to have a huge VBS this year and this would be perfect! I hope you pick me!!!! Thanks for the opportunity! This looks like a fun way to learn about our Creation and Creator. Thanks for this opportunity…my kids would love this VBS! Our children at Full Gospel Fellowship would love having this kit to start off the NEW of never having vbs. But our new Pastor is making change. Praise the Lord. Thanks God Bless. I would LOVE to use this for our Sunday School. The children would just love it too!! Looks like so much fun and an easy way for teachers to teach their lessons. Our kids at New City Church would love this mars…velous outer space and beyond our galaxy experience!!! Our volunteers will have a spaceblastic time too!!! Love it!!! Am so excited, its truly a blessing what you do. Our church is in Zambia in Central Africa and we have never had a VBS, but our children get to go to other ministries because we cant afford the it. It would be really nice to share these lesson with our children, I am sure they will love it. Thank you for this opportunity of taking part this great ministry. Who wouldn’t want this exciting adventure! This would be wonderful to educate our VBS kids on outer space and God’s hand in the creation of outer space. Thanks! This would surely bless our small hometown church. The children in our children’s ministry program would adore this! It would certainly reach far beyond the moon and back towards teaching them the wonders of our loving and powerful Lord! This looks like so much fun! I think this would be an awesome outreach project for our church. Our kids would love to do this VBS theme! it is different and looks exciting! Our budget has never allowed us the indulgence of a new VBS kit. We have always used bits and pieces or homemade. Winning this would be a prayer answered! Thank you for the chance. I think being at a Military Chapel, our kids would find it fun to be a on a mission just like their parents but to Mars. Looks really fun. Our kids ministry would flip! Space theme is always a winner and good content is a winner on the adult side? My 3 children and I have been attending and/or volunteering at VBSs at area churches for 12 years now. Wow! This year God has spoken to my husband, who is also our pastor, that our church will be doing a VBS of our own this summer! We are so excited for what God has for our church and community! We know this is only the beginning of our church ministering to the families of our community in a greater way. We’ve been looking at all the VBSs and really love the “Mission to Mars” theme! All these years of VBS and we’ve never seen a “space” theme. The Bible stories, focus verse, and daily points are perfect for where our children’s ministry is at right now. Thanks for the opportunity to win a starter kit! It would really help make our first VBS awesome! Wow! Without watching the video, this already sounds “WOW”. I can imagine traveling the universe with the children learning about the Cosmos and other wonders of God while still studying the lives of Bible heroes and thereby helping them to grow in the knowledge of the will of God. I say God bless you as you keep allowing the Lord show you ways to bring His Word closer to children’s hearts. The children /teenagers woukd love this program. Adventure is another way we can explore God-s word. I have been teaching in Sunday school in a local church in Nigeria for 7 year. I really want the children to have opportunity to learn more about God in exciting ways. Though local but i belief children here can also benefit from such wonderful experience in knowing more about God. God bless you. What an adventure it would be if my Sunday schoolers were given the opportunity to travel to Mars. We are from Jamaica and this is one theme we have never thought of exploring. Children need to know that they can be heroes for God. And this kit would definitely give them that experience. I have been working with the Youth in my church and my grandkids. And the most challenging experience is being able to keep the kids focus and the lessons fun. I believe just from watching your video that “To Mars And Beyond could meet that challenge. I want to be able to meet the need of educating kids to know at a young age that God’s word is their sword in life. One thing I continure to remind them is that we must need to know what that sword is made of. But I want them to have fun while learning. This could be the tool that I could use to Introduce VBS to the youth at my church and in the community. Looks great! I think the kids would love it! We just ran the drawing and you’re comment was the random winner! I’m sending you an email to get shipping information. Congratulations! The theme will definitely be the best.for our church who ministers to the children of different faiths during the VBS . TjTha you for giving us the opportunity to use your material. I am so done with pokemon and yugi oh cards. Its nice to get something the kids in childrens church can have that is fundamental to learning about God. My kids would love this new VBS! We’ve used Cokesbury VBS before and it was a hit! I think our kids would enjoy the outer space/science theme. Great memory verse! It is going to be Out of this World. The kids would really love this series. They are into Star Wars etc. I think it would keep them interested. I’m really excited to use this theme/series in our VBS to share and experience God’s Greatness to our students. Let the countdown begin to teaching kids these Biblical truths in an exciting fun way!! What an exciting theme! I have so many kids that are all about STEM and this VBS theme would fit right in. We are super excited for the chance of winning the starter kit. Tony Kummer (Editor) reviewed & updated this page on : November 16, 2018 at 8:40 am. All our content is peer reviewed by our readers, simply leave a comment on any post suggest an update.